Question: Is there a connection between that soul that the person must cultivate within himself and the properties of his beastly body? Answer: There is a certain connection between a person’s properties and the properties of his future soul, but it is very difficult, even impossible, for a person to understand what qualities a soul has to reveal. Question: Can a Kabbalist who is already on some spiritual level understand why he is in such a body with such properties and how he should develop from them? Answer: Yes, this is possible, but only if he is in spiritual attainment. Naturally, he understands what, how, and why. How Do You Discover Your Mission? What Is The Significance Of Earthly Life? The crisis of modern society is a very real problem; it announces itself every day announcing through newspapers, radio, and television. It began with Europe and now is spreading to America. The entire world is entering a new era and on the verge of large changes. The hope is that these changes will be realized through governmental and financial reform and not through world war. For the first time in history, the wisdom of Kabbalah is being revealed and is entering the process that is taking place in the world because Kabbalists are the only ones who understand what is happening, unlike all others who are in turmoil. The world acknowledges that it cannot understand not only the present situation, but also what prospects are available for the future or what means are possible for future progress and development. All this is very difficult to come to terms with, especially when we realize that we are talking about such huge masses of people, so different and distant from each other. All of Babylon, where Abraham once began his work, today begins to be more and more connected in all possible egoistic ways, one more explosive than another. Babylon is a symbol of huge egoism, the “anti-Creator,” revealing itself between all creatures. Therefore, it is very hard for a person to understand how this egoism can be subject to any correction. But as the wisdom of Kabbalah is revealed, it explains that it can be corrected, and we are obligated to do so. If not willingly, then by the path of suffering, but humanity will need to return to the state where it is once again as one body, one soul, one system, like the first man, Adam. This system will draw the entire Upper Light of Infinity and all of creation will reach adhesion with the Creator. This final state cannot be changed; there can be no compromises. The only difference lies in how much of its own effort humanity will put into achieving this, how much it will understand the essence of the process, and how much will it desire to participate in it. Some people should lead this process and this part is called “Israel,” which means “Li Rosh” – “I have a head.” And all the others act in relation to the head as a body and receive from it what has already been prepared for them; that is, they aren’t obliged to perform such difficult work. Of course, during this process there will be many questions and problems that will need to be resolved with the help of integral upbringing. It is impossible to make a single change through force but only by an internal change in an individual. There is nothing to change in the world—no external changes outside of a person will help because the external world is a reflection of our inner qualities. Therefore, the only thing needed is to correct the individual and by doing this we correct the world. This is our entire work: building such systems through which the Reforming Light will reach to the last human being. At the head of this system will be the Kabbalists who have a connection to the Creator and can make themselves a channel for passing the Light to all of humanity, to all the nations. This process is beginning to be realized in the world, and therefore the world is quickly adopting new contours. Whether we want it or not, the upper governance is preparing humanity to receive integral upbringing. It is the call of the times. 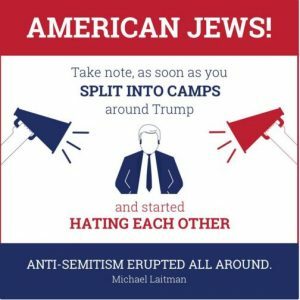 American Jews: As soon as you split into camps around Trump and started hating each other, antisemitism erupted all around. Everyone must understand that Kabbalah speaks of man’s correction, i.e., Creator’s work (Avodat Hashem) – it is the Creator who corrects us. Spiritual law of mutual guarantee: everyone can change everyone else’s destiny, but never their own. A positive consequence of antisemitism is that American Jews have become less arrogant, more humane, compassionate, and empathetic. What is this picture that unfolds in front of us? It is nature that is revealed more and more both within and around us. We uncover nature deeper and deeper and see that we exist inside the system. Apparently, as we exist in it, the system advances us toward some goal. On one hand, man is a product of nature. On the other hand, we are special creatures of nature that can reveal their maker. Who created us? Nature. Who advances us? Nature. Where does it move us? Judging by the history of our development, by the process of evolution, we can figure out where we are heading to. So let’s investigate this and find out! The wisdom of Kabbalah differs from religions in that it gives a person tools for the revelation of the upper force. It tells him what he must do, instead of crying and praying to the idols that we ourselves made in hopes to beg for a good life. The most effective form of study that helps a person to advance is the wisdom of Kabbalah. This is the difference between the upper force that religious people imagine and the one that Kabbalists, who have contact and relationship with this force, discover. Kabbalists can address the upper force, receive from it, and have precise interactions with it. And the upper force, meaning Nature wants us to be in such interaction with it. By working with the system of nature, we gradually begin to reveal within it the mind and the feelings that each time are one degree above us. The problem is that we can’t imagine the upper force that is not clothed in the matter and form. If the upper force is the entire nature, then it as if disappears for us. However, it is revealed precisely in the connection between us in a very clear manner. We have to reveal the Creator as our friend. Question: The nation of Israel was founded on the principle of unity and it has to be as one man with one heart. However, the nation consisted of 12 tribes that were separated to such an extent that even marriages between them were forbidden. Each of them had its own purpose: solders, workers, scientists, traders, shepherds, peasants, and clergymen. Where did such a division come from in the nation that is founded on unity? Answer: This division exists precisely because the people of Israel are founded on unity. After all, if we want to unite, we don’t erase any personal characteristics of a person, tribe, or nation. On the contrary, as we advance further, the uniqueness of each one is enhanced and expressed more. We are called one nation when we can unite above all these differences and incorporate them into our union. The connection should be so special that no difference is erased or disappears in it. This is the very first condition because we check the correctness of the union precisely by the fact whether or not love covers all transgressions. The differences remain, but love reconciles them. All the beauty and the power of love are determined exactly by the preserved differences. It’s similar to how spices, such as salt and pepper, sharpen and emphasize the taste of food. Or like a married couple that sometimes needs a quarrel to feel the strength of their connection with each other. If we just want to erase all the differences, it doesn’t work as we see from the example of the European Union and a large number of divorces. We don’t know how to connect people so that all their characteristics are preserved together with the connection. Such a connection is called the middle line that doesn’t erase the right and left lines, but builds something new in the middle. Our egoism consists of four levels: inanimate, vegetative, animate, and human. The left line is pure egoism that divides and separates us. The right line wants to connect us by averaging and erasing all the differences. If we follow these two lines, hatred and love, without combining them correctly, we won’t succeed. In the correct connection, both left and right lines connect with each other. As a result, four levels of the left line (inanimate, vegetative, animate, and human), four levels of the right line, and four levels of the middle line give rise to the twelve tribes of the people of Israel, each of which retains its character and purpose. How Were The Twelve Tribes Created? Torah, Deuteronomy, Ki Teitzei, 21:10 – 21:13: If you go out to war against your enemies, and the Lord, your God, will deliver him into your hands, and you take his captives, and you see among the captives a beautiful woman and you desire her, you may take [her] for yourself as a wife. You shall bring her into your home, and she shall shave her head and let her nails grow. And she shall remove the garment of her captivity from upon herself, and stay in your house, and weep for her father and her mother for a full month. After that, you may be intimate with her and possess her, and she will be a wife for you. How will I be able to actualize this desire? Desire is always feminine. Among many of my desires some are already under my control. There are others which I can easily correct with the help of particular mutual efforts with others. Having removed the male level of intentions, I move to the female level of desires, and look to see with what am I able to work. Let us say, I meet a woman, that is, I see a very bright, intense, strong desire, but it needs to be corrected. If I do this correctly, creating on top of it a true intention toward the Creator, then as a result, I come closer to a connection with Him. That is why I yearn for these desires or “desire beautiful women,” it does not matter what we call it. In either case, we should not imagine this as scenes in our material world. So when I see that I have an opportunity to take a “captive as wife,” that is, to reveal within myself such desire, illuminate, correct, and aim it toward the Creator, I gladly move toward it, even though this will entail very difficult work. Because now I need to rise above this desire, rejecting my previous life. It’s because on the previous level I was a corrected person. But now I move toward conquering the next level, “the Land of Israel,” which will connect me with the Creator and on which I will attain Him. But when I begin to reveal within myself this level of egoism, I suddenly see that there I have many selfish intentions (spiritually male entities), and all of them rule over female desires. In light of this, I need to keep the desires and change the intentions. That is why, as it is said in the Torah, I need to kill all the men and sanctify all the women. And here there is a list of rules of how it is possible to initially correct these desires, while I am not able to work with them in order to bestow. In other words, desire is a woman whom I have to bring home, sit her down separately, have her shave her head and grow her nails, wash herself, and weep for her parents. And only after she goes through this entire preparation process and is completely under my control, I can begin to work with this desire in order to bestow. In this way, I conquer the Land of Israel. But without captives, I would not have achieved this because without them, I have no desires. Rising to the level of wanting to work directly with the Creator, I reveal the desire called “captives,” as if they are not my own; they are alien, egoistic, heavier, more coarse, opposite to the Creator. I must destroy previous egoistic intentions, but in order to work with these desires in an altruistic way, I need to first cleanse them, that is, correct them. Question: What is meant by “shave the hair” of this desire? Answer: The word “hair” (“Searot” in Hebrew) comes from the word “Soer,” which means “excitement, agitation.” Within a person appear all kinds of burning desires with which he cannot be connected to the Creator. That is why they need to be “shaved” and cleansed in water, in the Light of Hassadim. Question: What is meant by “weep for her father and her mother”? Answer: Tears are the overflow of Light, which the person is not able to receive within their uncorrected desires. That is why she needs to cry them out. Question: Is it possible to compare the way of the soul with the birth and growth of a child—a period of unconscious and a period of conscious maturation? Answer: Of course. The basic text of Kabbalah Talmud Eser Sefirot, for example, tells us about the birth of the soul, its development as an embryo in the womb, its birth, the period of suckling, the period of smallness (youth, and how it grows until it becomes big (an adult). That is, all the phases of the soul’s development is the subject of the study of the wisdom of Kabbalah. Question: Where does a person’s thoughts originate from according to the wisdom of Kabbalah? Answer: Thoughts are a product of the desire. Desire is the basic matter of man: I seek to fill my emptiness. As a result, thoughts appear to choose how I can fill myself. Question: Where do the feelings, the emotions, come in? Answer: There is no reference to such concepts in Kabbalistic sources. There is a desire and there is the mind that helps fulfill the desire. The intention is an additional level above the desire that expresses what exactly a person wants to use it for. The desire comes first and the mind is secondary because the mind never changes the desire; on the contrary, the desire governs the mind. No matter how many philosophers, writers, poets, art critics, and people engaged in the arts wanted to present this to humanity—our corporeal desire manages everything. Question: What do different emotions, like joy, humor, etc., mean according to the wisdom of Kabbalah? Answer: These are all feelings in the desire. Question: What is the function of the feelings and the mind in a person’s spiritual development? Answer: The role of the feelings is to show what is happening in a person’s desire and the role of the mind is to be able to work with these desires. But the mind itself doesn’t work on them. It can manage the desire only through the Light that Reforms. We often see psychologists, and experts in other pseudo-scientific areas in our world who are trying to work with a person’s internal world, with his thoughts and his desires, but they do not succeed. Being the product of desires, thoughts can help a person manage his internal world, if with the help of his thoughts, he creates in his desire the conditions under which the Surrounding Light begins to impact him. Torah, Deuteronomy, Devarim, 12:18: You shall appoint judges and officers in all your towns which the Lord your God gives you, according to your tribes; and they shall judge the people with righteous judgment. Who are the judges? This is the main problem. The judges are those who are above the person; the person appoints them by himself so they can restrict him, show him the way, and lead him further to “all gates” in all his movements, from the external world to the internality of a person, and from the internality of a person to the external world. In our desires, decisions, actions, and even thoughts we should set up various systems of verification, analysis, and synthesis of what we are about to do; that is, we should create the system of control and analysis within us that would activate the executive system. This means that everything that exists today in the country should be within us. The gates are the filters through which we act, they allow or prohibit us to establish contact with the outside world and even with ourselves. But with ourselves, this is already a somewhat different system that is arranged differently. That is why the filters, for the most part, are related to the interaction with the external world. If a person really desires to improve, he can not manage without this.